Akuafoil (Unlimited metallic foil) gives you a wide range of CMYK colours with a sparkling foil finish and an ideal reflection that is priced to give you a true competitive advantage. you can turn a wide range of CMYK colours into multi-coloured foils. Akuafoil uses a special processed foil system that is applied under a 4/c process to create an array of foil colours. You can produce foiled half tones, gradients and have multiple colours in foil on the same design. 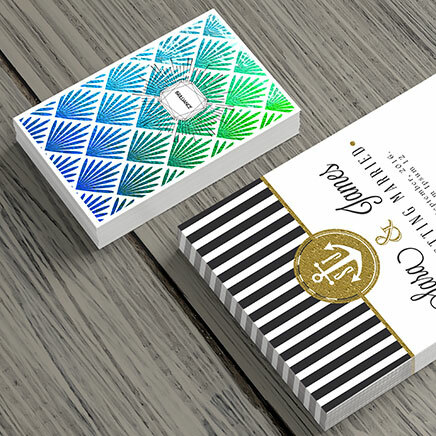 The design possibilities are limited only by your imagination, giving your cards an exquisite edge. Akuafoil works best on lighter colours. The darker the CMYK colour, the less vibrant the Akuafoil effect. For better quality, we recommend creating mask files in vector based programs such as Illustrator or CorelDRAW.